Thank you so much for the best stay we could ask for in Marrakesh! The host is so lovely and will do everything to make sure you have the most enjoyable stay. It is the perfect location, really close to the main square but as it's down some side streets it's really quiet at night so it feels really chilled. We did a cooking class there, a traditional hammam and was given great tips for our trip. Lovely breakfast and the decor and design of the riad is beautiful. Thank you so much! Everything about this place was great. 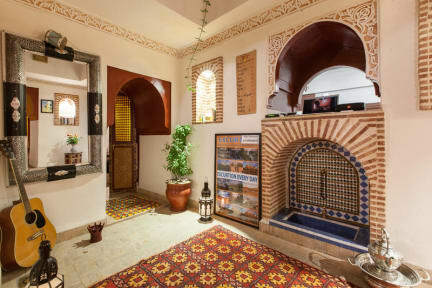 In a quiet street of the busy Medina with everything nearby, the terrace super chill for breakfast and evening tea chat, the breakfast fulfilling with great bread, the room beautifully furnished and well kept, and most importantly the atmosphere. Rachid, Aymen and Hamid made me feel a part of the family because they three are ! And they make the place a cozy Riad for all the guests. This is be the only place I am staying when I come back to Marrakesh. Amazing stay, best hostel experience to date. Great location, though can be a little difficult to find. Tucked away from the craziness of the medina despite being in the medina. Beautifully kept, clean, spacious rooms. Abundance of hot water. Above all, the owners are incredibly thoughtful and generous. Breakfast was out of this world and so delicious. Would highly recommend. Amazing breakfasts, very friendly and helpful staff and a fantastic location. This is a great place to stay in Marrakech with finding it at arrival an adventure in itself. We stayed for couple nights in Ben Saleh and we were very pleased with pretty much everything. Excellent staff, location and service. Hamid and Ayman were very helpful and they truly tried to make our stay as enjoyable as possible. Would definitely recommend it! Riad is located very close to the main square (~5min walk) thus you don't have to wander in narrow medina streets. Staff - Aymen and Hamid - are exceptionally friendly and helpful, breakfast was also the best we had comparing to other places we stayed during our stay, room and bathroom were very clean. Highly recommended! 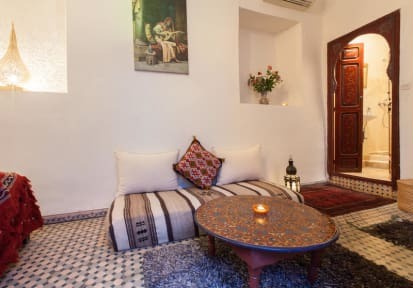 This is a beautiful riad located in the Medina - it is definitely difficult to find the first time and is a bit sketchy to walk to at night, but is certainly centrally located for easy access to many of Marrakech’s sights. The rooms, bathrooms, and rooftop are gorgeous. Staff was incredibly helpful - they came to find us when we got lost going to the riad and were helpful with arranging an early morning airport transfer. Really kind staff, thank you again. Very clean and nicely decorated rooms. The rooftop (especially at night) and the free breakfast was the best part. Not very easy to find in the maze that the Medina is but they were helpful. The staff was friendly, as well. I would stay here again!